The Next Step in Chromatography! 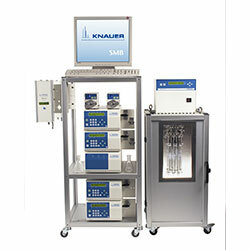 Continuous counter-current chromatography, also known as Simulated Moving Bed (SMB) is a highly efficient separation technique in the field of preparative chromatography, for the pharmaceutical industry, production of fine chemicals, and in the field of bioengineering. Simulated Moving Bed is a method in process chromatography that enables pseudo binary mixtures to be separated into pure substances or fractions with maximum yield and purity. By repeated use of the SMB process each partial fraction can be separated into a further fraction - up to binary substance mixtures. Typically, the SMB process is set up in advance for a two component mixture. Following this, both substances can be immediately extracted in pure form - up to 1,000 kg per year. Where can a SMB separation be used? When is a suitable time to set up a SMB process? The entire stationary phase is continuously covered with the mixture to be separated which produces a much higher productivity. A 90% reduction in the demand for solvent due to solvent recycling. High plate counts or particle sizes are no longer required, reducing packing material by 80%. Extract and raffinate are extracted (in high concentrations) which make it easier to remove solvent. The patented multifunctional valve enables an extremely low dead volume. Determine the phase volume ratio or porosity between the stationary and mobile phase. Determine the adsorption isotherms for each component based on the overload chromatogram from each component or the mixture. Determine the isotherm parameters using the IsothermFit® software. Simulate the process and optimize the interpretation using the SMB_Guide® simulation software. Carry out a continuous "SMB separation". Developed by the Max Planck Institute for Dynamics of Complex Technical Systems (Magdeburg, Germany) the ModiCon technique is being distributed exclusively by KNAUER. With the ModiCon, throughput and purity can be further increased by modulating the inlet concentration. The Pilot SMB System CSEP C9116 is designed for the extraction of pure substances in gram-scale. Special emphasis is put on the continuous operation mode and high productivity. The system works thermostatically and can be operated with up to 16 SMB columns of the same type. The patented multifunctional valve drastically reduces the dead volume and provides for the compact design. 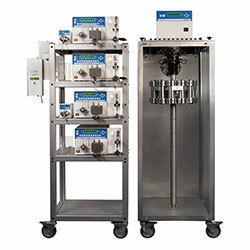 The Production SMB system CSEP C9812 is designed for extraction of pure substances in kilogram-scale. The system works thermostatically and can be operated with upto 12 SMB separation columns of the same type. Due to its mode of operation the system works very efficiently.